Organizers say they'll call for President Donald Trump to end the shutdown that's impacting Transportation Security Administration agents and flight traffic controllers. 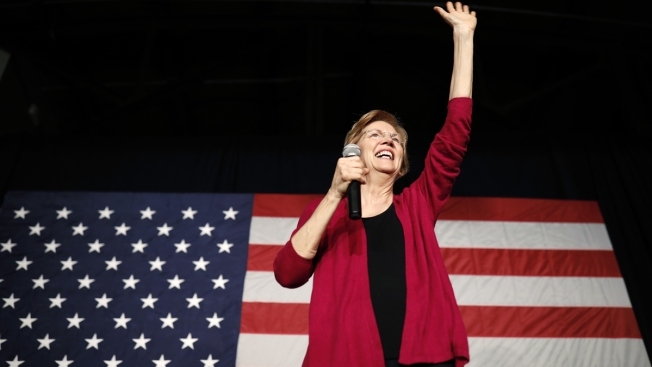 In this Jan. 5, 2019, file photo, Sen. Elizabeth Warren, D-Mass, waves to the crowd during an organizing event at Curate event space in Des Moines, Iowa. Some of the Democrats considering running for president in 2020 say they plan to ignore personal needling from President Donald Trump. U.S. Sen. Elizabeth Warren plans to rally with Boston airport workers to highlight the federal government shutdown and other concerns. The Democrat, who is weighing a run for president, will join labor union leaders, workers and other elected officials Monday at Logan Airport's international terminal. They'll also highlight a dispute between an airport contractor and baggage handlers, skycaps and other airport workers seeking to unionize. Warren is also speaking Monday at the Martin Luther King Day Memorial Breakfast at the Boston Convention and Exhibition Center.